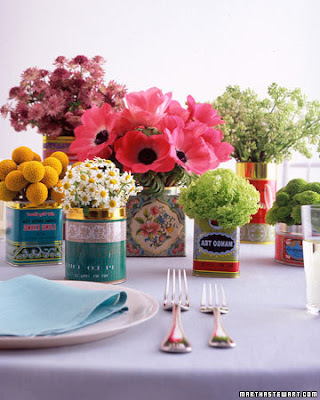 Browsing through the pictures on Martha Stewart Weddings, we came across this one of a whimsical centerpiece using tea tins. We smiled to ourselves and pulled up a picture of our own! We did a very similar design last year for one of our brides who brought in her own decorated tea tins. Have a look!